As instructors, we spend more time with our clients then probably their best friends or family members. Our job is to nurture those relationships on a professional level, helping our clients to feel comfortable enough to freely and openly move their bodies to transformative places. trusting you with that time. 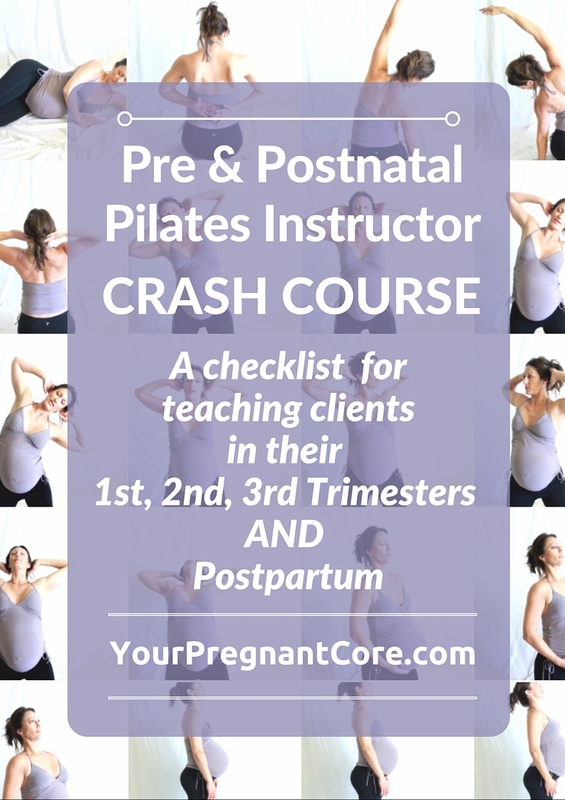 As a pre and postnatal fitness professional, you should have a basic understanding of the precautions and contraindications (when it is absolute to not exercise). you will be an amazing instructor! Always make sure your client has cleared exercise with her doctor. In addition to communicating with your clients, it is recommended that you have some line of communication with your client’s doctor, health care provider, or midwife. Dr. Clapp, the author of Exercising Through Your Pregnancy, recommends an individualized team approach among health care providers, fitness instructors, and the pregnant woman. Below you will find the basic guidelines to exercise and pregnancy, as the American College of Obstetrics and Gynecology, the ACOG recommends. Read more about the ACOG. The changes in your body can make certain positions and activities risky for you and your baby. While exercising, try to avoid activities that call for jumping, jarring motions, or quick changes in direction that may strain your joints and cause injury. There are some risks from becoming overheated during pregnancy. This may cause loss of fluids and lead to dehydration and problems during pregnancy. After the first trimester of pregnancy, avoid doing any exercises on your back. Take precaution toward the end of the 2nd trimester. This is a general rule due to the possibility of cutting off circulation of the vena cava, an artery that runs to the woman’s heart, due to the weight of the uterus. There will be symptoms like feeling short of breath and dizziness. Every woman is different. Some women are fine on their backs well into the 3rd trimester; others become uncomfortable much earlier. To modify exercises on the back, keep in mind that the goal is to get the uterus (pregnant belly) bellow the heart. You can do this a few different ways. Use an upside-down jump board to prop heart above baby. Use a slightly deflated big-ball to prop. Use a big ball for exercises on the trapeze, or on the mat. In this case, begin pre-Pilates exercises such as Lateral Thoracic Breathing, Pelvic Floor Exercises, and Posture exercises. You should also begin to educate your client on what to expect during her pregnancy, and her sessions with you. I always have a fan available in my studio to ensure my pregnant clients to do become overheated. One of the many comforts of Pilates-wearing cool, comfortable clothing, and getting work without shoes! Another benefit of Pilates-the extra weight of the breasts should not hinder exercises. Make sure to remind your client to take a water break every 15 minutes. I set a timer so that I don’t forget to do this. Unless you have a background in nutrition, steer clear of giving too much nutrition information. Find a good nutritionist in your area and develop a working relationship with them. You could then refer your clients to them, and possibly work out an affiliate deal. What are the warning signs that my client should stop exercising? The most important thing to remember is to keep the lines of communication open with your client. Ask how she is feeling. Nothing you do should hurt her. Remember, we are going for moderation. The 3rd part of this series, I will talk about what you need to know when designing an exercise routine for athletes. Thank you for hanging out with me! Awesome that you have taken the time to educate yourself!